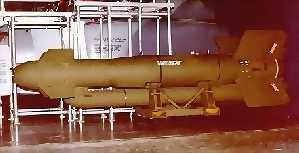 The AGM-130 is a rocket-powered derivative of the GBU-15 modular glide bomb. It is comprised of a 2,000 pound bomb fitted with a target detector and mechanical control fins. The additional range and mission flexibility of the AGM-130 greatly increases the survivability of the launching aircraft and crew. The AGM-130 has an operator-controlled, data link guidance system. It uses either TV (day) or imaging infrared (night) target detectors. The rocket motor provides a range of 40 miles and a radar altimeter enables the bomb to approach a target from as low as 200 feet above the ground. Target detectors, warheads and airfoil groups are all interchangeable, allowing the AGM-130 to be tailored for a specific target or situation. The AGM-130 is normally employed in an "indirect attack" mode, where the bomb is released at a pre-planned position and then guided to the target using data link information. In the "direct attack" mode, the AGM-130 target detector is locked on the target prior to release and the bomb guides itself to impact. TheAGM-130 weighs 3,000 pounds at launch. The weapon system is managed by the Aeronautical Systems Center, Eglin AFB, Florida. It currently is in production (1992) and is scheduled for deployment on F-111F and F-15E aircraft. Approximately 4,000 AGM-130s will be procured under current planning. The weapon on display was received from Rockwell International Corp. in July, 1992.